Last night when we got home from work, Dan and I headed out into the garden to get to work on deweeding the patio and planting some veg into the side borders. Every year my Mum gives me loads and loads of vegetables to plant in my garden. Some years it works well, other years I end up killing the plants and there are some years where I end up with so much veg I could open up my own market stall on the side of my street with the amount I harvest! This year could possibly be one of those years as she sent me back with tomato plants, strawberries, carrots, peas, a squash, potatoes and more lettuces. There is also a tray of sweet peas to add to the list! Dan brought his laptop out into the patio while I was chopping back the shrub that falls across the patio about this time every year. After a little while I noticed two robins fluttering from fence post to fence post and scalding us constantly. I mentioned to Dan perhaps they had a nest nearby, not considering for one minute that it would be in the middle of the prickily shrub I was in the middle of cutting back, so close to the house with a Bella-cat, but as I got a little closer to the bush I could hear a faint ‘peep, peep!’ so I moved further up the garden to work on a different area instead and leave the nest alone. The two parent birds continued to scald Bella from afar who had begun to watch them and follow them round the garden. They were too quick for her though and every time she started to get close they would shoot off to a safer post a little further away from her. 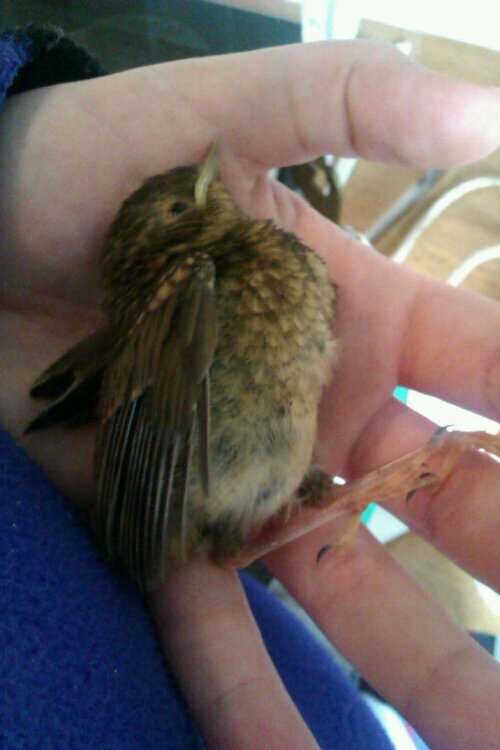 Next thing I knew Bella had jumped the fence into our neighbours garden, gotten hold of a baby robin in her mouth and yanked it over to me. I shouted at her until she dropped the bird which I picked up but was unsure what to do with. It kept flapping and squirming in my hand – I didn’t think it was going to die as it still had a lot of strength left in it but I knew I had to get it back to the nest soonish. Dan shut Bella in and we tried to climb up the fence to see if we could get a better view of the nest from up high, but I couldn’t see a thing. Our next door neighbour wasn’t home so we couldn’t get into her garden to try and reach over. Not long after I took this photo the baby bird died in my hand. Bella snuck out past us later and returned with another baby bird. This one was already dead by the time she gave him to us. I see lots of kids being cruel to other kids every day in my job but cats are really cruel creatures. She wouldn’t have eaten the bird, but rather let him suffer and ended up leaving him to die on our step. Each week I end up moving a collection of voles and birds from our back step. It really upset me today that the poor robin parents had lost two of their babies to Bella on the same day. I know it’s all part of being a cat owner, and it’s just in her nature but she’s grounded right now. No outdoor roaming for the next few days whilst the birds learn to fly. Supervised watch only. My food yesterday wasn’t great. 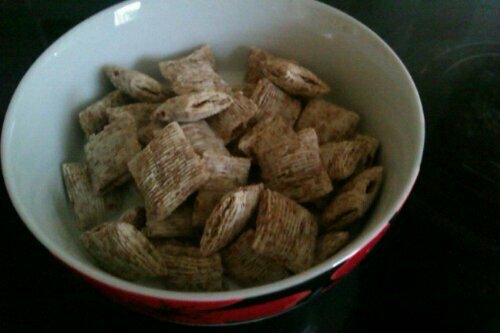 Breakfast was the same cereal as always, but this was the last of the box so I’ll have to be more creative the rest of the week! I completely forgot my lunch in the morning which was frustrating as I’d rung Dan on Sunday night and specifically asked him to pick up a lettuce before the shops shut. 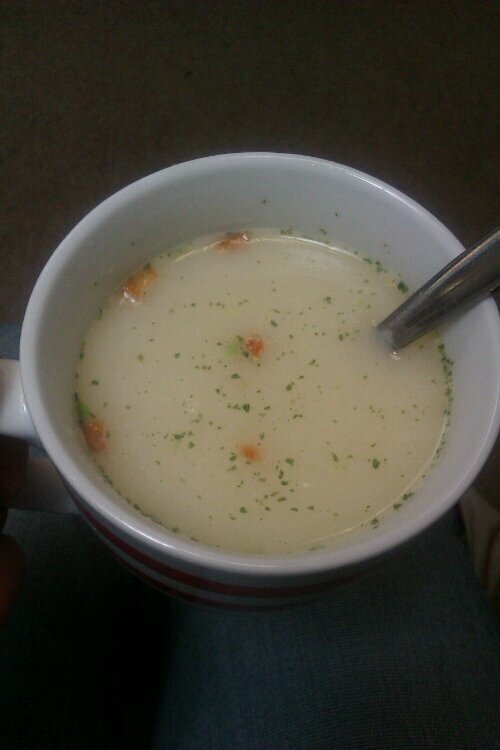 Luckily I found a veggie cuppa soup at work so I did have something at lunchtime. 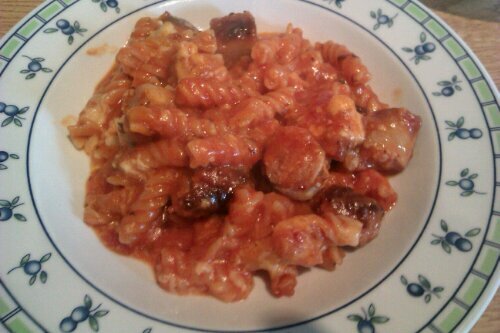 Dinner was just a tomato based pasta bake with some sausages thrown in.